Thanks for offering to help out with providing translations for our “Preserving Indigenous language programs”. By providing a collection of core words along with their translations, you will enable us to produce resources which can be used within your specific region. 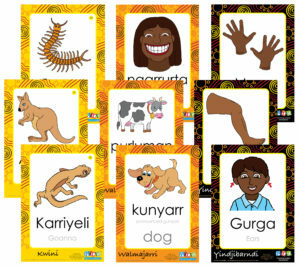 The charts will assist teaching staff to reinforce the local language or languages. If you have any supporting resources or additional information you would like to submit, please attach it in the section at the bottom of the form. We hope these resources that we will produce together will be useful and we thank you for taking the time to assist with the translations. Once the programs are completed, we’ll be in touch to check we’ve got it all right and will send you a few copies free of charge to thank you for your involvement. Into which language are you translating the words? Please enter the English and translated words with pronunciation below. You can add up to 20 words with translations.